Over Chanukah, I travelled up to visit my 19-year-old daughter, Hadas, who is a national-service girl near Nahariya. 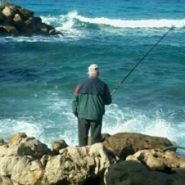 One morning I sat to pray on a bench overlooking the Mediterranean, and I noticed this fisherman. The sea has existed forever. And it will exist forever. Come for 120 years to connect day by day, moment by moment, with Hashem’s eternity. 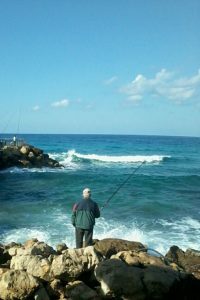 Amazing how the sea gives such a feeling of expansiveness and smallness all at once… You might not be wearing tztzit but I think you’re living with the awareness of Hashem in every moment – how powerful!